You know that hopeless, frustrated feeling when you're driving down the road looking for a business, and you simply can't find it? A GPS will say what side of the street you're on, but if you don't have a quality sign in front of your business, you won't be noticed by potential customers. A Business With No Sign, is a Sign of No Business! So come to http://www.thesignstudioonline.com/! Where we offer quality! No one wants to walk into any office or storefront with a cheap business sign out front. Your sign is your customer's first glance at YOUR quality. If you have a cheap sign hanging outside your front door, your customers are going to expect cheap work, or cheap product. It is as simple as that! No matter what kind of business sign you need. Whether an exterior sign, or interior sign, we are a full service sign company and offer any kind of business sign that you need. We do Vehicle graphics, Banners, window graphics, site signs, monument Signs, architectural and directional signs, sandblasted signs, 3D lettering, illuminated signs, and professional graphic design.Our team of talented designers and fabricators are facilitated by state-of-the-art, computer-aided systems and sign making techniques. You will receive professional, eye-catching signs that will attract customers, and show them the impressive quality of your business before they even walk in the front door! And don't forget... A Business With No Sign, is a Sign of No Business! If you have any questions or need assistance with anything, please give us a call at The Sign Studio (818) 843-9200 or send us an e-mail at info@signstudiola.com. for sample pictures or further information / Quote. Do you need more business? Is your client base dwindling, in need of a drastic overhaul or just needs to increase? Are referrals and other marketing techniques not permitting customers to provide you with the necessary sales to increase your profits exponentially? Well, the solution to your problem may be the exciting, innovative and customized signage The Sign Studio creates. One of the best ways to drive sales dollars at any business is to market in a manner that is consistent with the standard of quality and expectations of the company. The Sign Studio uses high quality techniques and services that will take your business to the next level. With innovative, thought-provoking and eye-catching graphics, your business will be given a dynamic, visual platform that will drive sales. The Sign Studio provides a myriad of signage that can be customized to meet the needs of any business. 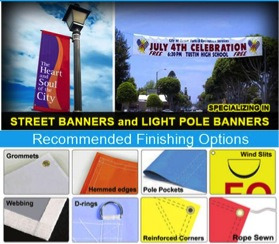 State of the art techniques are implemented to provide the highest quality signs & banners. Custom creations are readily accessible as well in the form of graphic design. 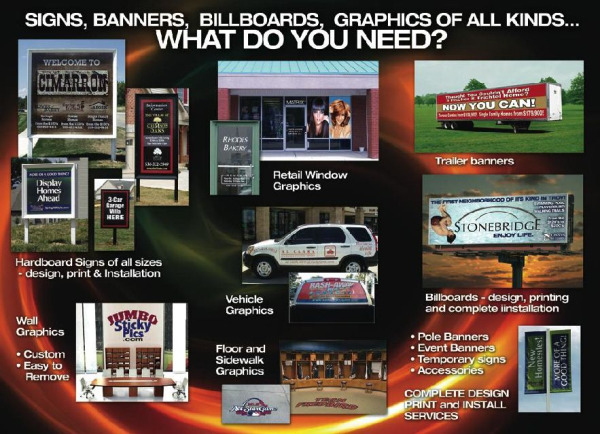 From banners to site signs to window graphics to vehicle graphics and monument signs, one or all of these types of signage can be created and utilized to advertise your business. The Sign Studio will provide your business with the catalyst it needs to drive sales and increase profits. Place your order today! If you have any questions or need assistance with anything, please give us a call at The Sign Studio (818) 843-9200 or send us an e-mail at info@signstudiola.com. EXTERIOR GROUND SIGNS - COST-EFFECTIVE COMMUNICATION! Proper signage is often a key to a great first impression. Attractive and eye-catching exterior ground signs are a cost-effective way to increase your visibility and communicate clearly with your clients and customers before they even reach your door. The Sign Studio, serving the greater LA area for many years, understands the importance of great signage because signs are all we do. Whether you need post and panel signs for a single business, a residential development or a whole business complex, The Sign Studio is your best bet for on-site outdoor signage designed to help your current customers find you and attract new customers by increasing your visibility. As a full-service sign company, The Sign Studio offers a wide variety of stakes and frames, curbside signs, small directional signs and large site signs. Our skilled artists and craftsman will take your great ideas all the way from the design table to installation. Well designed exterior ground signs literally lead your customers to your door and are one of the most effective, low-cost instruments in your marketing toolbox. Let us help you make the most of that instrument and communicate in new and exciting ways with your customers, clients and the public at large. lluminated Signs will Light up Your Business! Do you need illuminated signs or a light box for your business? What are L.E.D. Illuminated Signs? LED stands for Light Emitting Diode. LED technology has been in use since the 1960s. Illuminated signs can be freestanding or fixed to a building. Uses 12 volts, as opposed to neon, which uses up to 9,000 to 15,000 volts. Neon has been faithfully leading the industry for illuminated signs for over a hundred years and is still a good option. Change is inevitable, however, and The Sign Studio is on the leading edge of exciting LED technology. We’re here to help you with your signage needs!For more information about the benefits of LED Illuminated Signs, visit our blog. Ready for illumination but interested in neon signage instead of LED? Download our guide to neon signs. Ready for a quote? Click here. The Sign Studio is prepared to meet your needs for a light box or illuminated signs! Looking for Stop Signs, No Parking Signs or Custom Parking Signs? You have come to the right place - The Sign Studio in Burbank, CA - serving all of Los Angeles County. Have you ever been at your place of business when you suddenly hear the sickening crunch of metal? An accident in your parking lot should lead you to rethink your traffic flow. The Sign Studio can help! We offer all types of directional signs, stop signs, parking and no parking signs. We are able to provide traditional signs, as well as more personalized ones, to suit your particular needs. Don't lose business because people are afraid to pull into your lot! Don't risk a lawsuit for lack of signage! Most people don't think about their parking lot as a sales tool, but when customers patronize a business where they have to weave in and out to avoid other cars or have gotten their car towed for parking in a no parking zone that has not been distinctly marked, they tend not to make a second visit. A smooth flow of traffic, along with the ability to move people in, out, and around your parking lot with ease is just one more way to ensure repeat business. Remember, your parking lot is the very first, and very last thing, your customers see. From start to finish, The Sign Studio's easy solutions will make your customers feel that they are going in the right direction - right to your front door!